Early next week, a NASA craft designed to hammer the moon will travel from California to the Kennedy Space Center — one step closer to the planned April 24 launch. The Lunar Crater Observation and Sensing Satellite, or LCROSS, will hitch a ride to the moon aboard the Lunar Reconnaissance Orbiter. The orbiter carries a suite of instruments for taking detailed temperature readings, looking at the effects of radiation on the lunar surface and scoping out good landing sites for future missions, among other science goals. Sound a little intrusive? That’s nothing compared to the 15-foot (4.5-meter) deep, 100-foot (30 meter) wide hole that LCROSS will gouge into the lunar surface. The whole package will spend about four days in transit to the moon, and then will orbit for several months, searching for the best impact site and setting up a prime trajectory. Around the first of August, LCROSS will approach the moon in two parts. First, it will fire its car-sized rocket to separate from the orbiter, then quickly shed the rocket and send it pummeling into the moon — at a whopping 5,600 miles (9,000 km) per hour. The target is the permanently shadowed floor in one of the North Pole’s craters, where ice is most likely to be hiding. The impact is expected to dislodge 220 tons of material from the lunar surface. Debris will fly as far as 30 miles (50 km) from the impact site, providing a Deep-Impact-style explosion that should be visible with amateur telescopes on Earth. Then, the LCROSS satellite itself will fly through the plume on a collision course with the lunar surface, sending information to Earth until the moment of its own demise. The Lunar Reconnaissance Orbiter will be watching, along with India’s lunar orbiter, called Chandrayaan-1, Japan’s Kaguya (SELENE) and a host of Earth-bound professional telescopes. The sweet spot for observing the impact will be just after sunset in Hawaii, and possibly on the western coasts of the United States and South America — with countries along the moon’s course catching the aftermath. Hints of water were sent to Earth in the 1990s, when the Naval Research Laboratory’s Clementine mission detected hydrogen signals at the lunar poles. The data did not reveal whether the element is contained in water or another hydrogen-bearing compound, such as hydrated minerals or hydrocarbons. LCROSS is the fourth mission to aim for the moon’s surface in the past decade. NASA’s 1999 impact with the Lunar Prospector failed to dislodge detectable water ice. The European Space Agency’s SMART-1 pummeled the lunar surface in 2006, while telecopes all over the world took data on the ejecta. India’s Moon Impact Probe detached from Chandrayaan-1 and crashed into the moon in October, with a goal of analyzing lunar dust and especially to find Helium 3, an isotope rare on Earth which could hold value for energy production. LCROSS will make the first definitive investigation for water within a permanently shadowed crater, the most likely place where it wouldn’t have evaporated over the moon’s history. 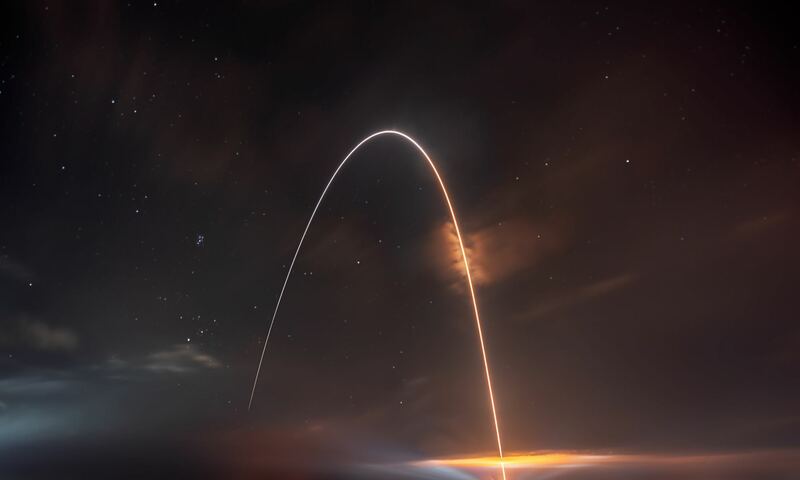 The $79 million, cost-capped mission is unusual because it utilizes commercially available technology for some of its software and scientific instruments. LCROSS could serve as a model for future missions that employ available technology, rather than relying on designs built from scratch, said Jonas Dino, a NASA spokesman at Ames Research Center in Moffett Field, California. Finding water on the moon would boost its usefulness for supporting infrastructure. The moon could, for example, serve as a launching site for manned exploration of Mars or destinations beyond. The moon’s gravity, just one-sixth the strength of Earth’s, would allow the use of much smaller rockets to go the same distance as missions from Earth. Hydrogen from the lunar surface could also be used in making rocket fuel, which would cut costs for space exploration. Sources: LCROSS website and interviews with NASA spokesmen Grey Hautaluoma, in Washington, D.C. and Jonas Dino in California. Cost-capped missions and using commercially available technology is the way of the future. Its amazing how inexpensive this mission is in comparison to others. What’s funny is that the Lunar prospector costed about $62.8 million in 1998. Today that would be around $79 million. The same value as LRO, but it will have much improvements plus an impactor. For now, and the near future, launching manned spacecraft from Earth in-bound to Mars with no in-space assembly is the most cost effective strategy. Constructing a vehicle factory on the moon for manned exploration to Mars and other destinations would be far more costly than the strategy above. That shouldn’t stop our aspirations for a self sufficient lunar colony, however. This mission is supposably to be praised for simplicity and sophistication at the same time, because already existing Earth-based observatories can be used to observe the effect of the impact. It is a sort of outsourcing the task of measurement. But it looks like to have just a hammer makes every problem a nail. A car-sized rocket impactor might weight about one or two tons. Assumed that the transport of one kilogram into LEO takes $20.000, this is not so expensive, maybe $50.000.000 cost of carriage only. Nevertheless, one can send a lot of equipment up there for that price. But the real costs could then accrue when the impactor would really evaporate water ice! Water ice can be assumed as one of the most precious ressources for permanent human presence at the moon. Possibly, the impactor would not only annihilate a few kilogram of water ice. “The impact is expected to dislodge 220 tons of material from the lunar surface.” Suppose just for a moment that they have a really lucky strike! What does it take to transport 1 litre of water to the moon? At least (but more than) $20.000! A lucky strike would destroy a fortune! Therefore I believe that it is a barbaric method. I can already hear the cheers and applauding in the control center! Wrong, we very much need in-space assembly of such ships…but *space* in this case means low Earth orbit, not anywhere on or near the Moon. And doing so, using spacecraft elements manufactured on, and launched *from* Earth. as Earth is and subject to much the same launch windows. it’s not the ‘way station’ it may seem. Some will tel you that it’s ‘cheaper’ to launch from the Moon, because less propellant is required. But ‘fuel’ is not the reason for the high cost of access to space. ‘Rocket fuel’ is fairly cheap and unlike aviation, it’s a small part of space flight operations. Having to burn somewhat more of it to achieve Earth escape vs. Lunar escape means very little. That’s not where the real costs are. This mission sounds really fun! Gonna have to throw a party on “crash night” for sure! I’m wondering, (being a novice at astronomy) would sending a rocket onto the moon for the purpose of creating a crater, have an affect on the moons orbit? displacing 220 tons seems quite a bit. Has anyone bothered to think about that? the moon weighs something like 7*10^19 tons (that’s a seven with nineteen zeroes after it). The amount of material gouged out will be nothing compared to that, and the effect on the Moon’s orbit will be essentially zero. The Moon has suffered much larger impacts in its history anyway. Reference this as an International Year of Astronomy 2009 event to get the public more involved in this field. Looking up on the web, the event should be observable with a 10 to 12 inch telescope on earth. Please update us with a calendar and where the even could be observed. “LCROSS is the third mission to aim for the moon’s surface in the past decade.”? None of that matters, if there’s no one there to use it. The probe that detached Chandrayaan-1 is Moon Impact Probe, not Aditya. Aha, thanks, John. Indeed, SMART-1 crashed on the lunar surface in 2006. Its Web site is here http://www.esa.int/SPECIALS/SMART-1/index.html, and I’ll update the story promptly. What a waste of resources this project is. that will move us a the speed of light? a lot of damage under the pretense of learning here on our home planet! Jet no cleaning the mess we made, LEARNING? and leaving the mess for others to clean up? clean up after you done making a mess? do that more cost effective! it could be used to smash up big cities on earth…depends on the payload..
That’s right. But otherwise, why should one spend several 10^6 dollar for detecting water ice if nobody will ever use it? If one wants to find out how it got there then this is the wrong method because the clash will change the location that clues of the origin will be destroyed. You say it by yourself that it will “just redistribute the stuff a little”, meaning that the evidence is altered. “Still, it’s not really going anywhere. I don’t believe the material will be thrown to Lunar orbital or escape velocity. Hopefully! The idea is that “a permanently shadowed crater [is] the most likely place where [water ice] wouldn’t have evaporated”. So when the impact causes debris to fly as far as 50 km, one cannot expect that it will not be exposed to sunlight and thus evaporate. Moreover, the concept itself has foreseen the evaporation of the deposit, because otherwise what should the LCROSS satellite be able to measure, when it “itself will fly through the plume? And besides from finding a hint for water ice at all, that method will not be able to reveal any clou about the features of its appearance on the moon at all. No idea of quatity, distribution, structure will be obtained. Moreover, those clues to the history of the moon would be altered and thus erased with the impact. Wait, are people really finding reasons to get upset that we are going to be creating a 100ft crater on the MOON? This is a great idea, and it’s much cheaper than sending astronauts to dig a 15ft x100ft hole in a shadowy crater to see if water is there! Why, no. People like Dollhopf already explained themselve in this thread. Is there any reason to misinterpret them purposely, Ronnie? But feel free to do what pleases your psychic balance!